Many hear the words “Waltzing Matilda” and immediately think of the song by Tom Waits (although the correct title for his song is Tom Traubert’s Blues). Others know it as Australia’s unofficial national anthem. Yet others know the title from the original poem written by Australian poet Banjo Paterson back in 1895 – he also penned other famous pieces such as The Man from Snowy River. Now the name Waltzing Matilda is becoming synonymous with quality, handcrafted, made-in-the-USA fine leather bags, and footwear. 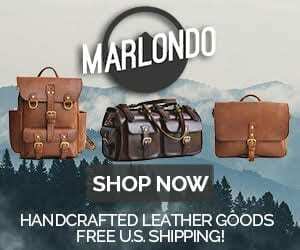 Not only is Waltzing Matilda committed to being made in the U.S.A. – they take it a step further by only using leather and other materials that are 100% sourced from the U.S.A. And, to top it off, all of their products are handmade. 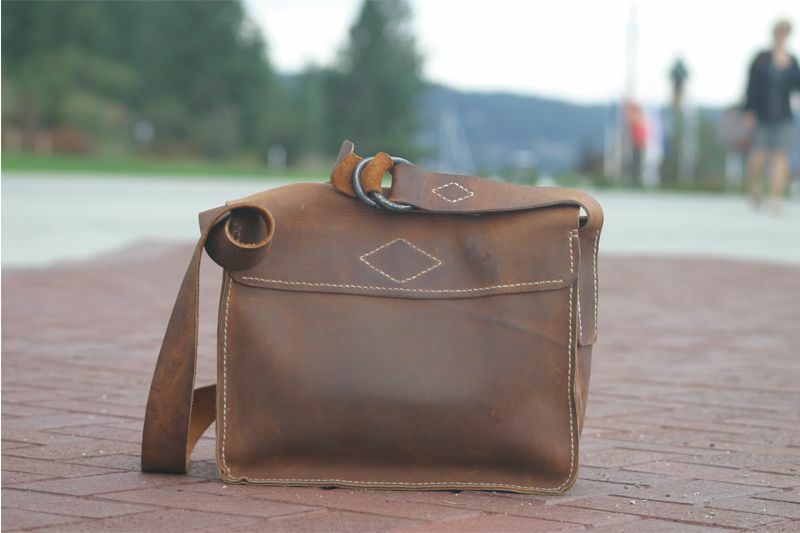 “Like a fine whiskey, Waltzing Matilda leather goods improve with age. The passing of time, use and personal journeys add depth, character and substance to these modern heirlooms.” Probably the best way to understand Mike Balitsaris’ passion for his products, how they’re made, and what they’re made from is to watch this short video of him discussing Waltzing Matilda. Waltzing Matilda from Jesse Brass on Vimeo. The Waltzing Matilda Tom’s Bag is created with leather from S.B. Foot Tanning Company in Red Wing, Minnesota. And, as mentioned in the video, Waltzing Matilda uses heavy gauge thread from Maine Thread Company. The leather used on the bag is incredibly soft and floppy. One of the unique features of Waltzing Matilda’s products is their use of hides that may not “pass muster” with other companies. In the photos here, you can see stretch marks on the front flap and what is probably a barb wire scar on the on the back of the bag. Some say those marks detract from the beauty of the bag. I tend to disagree, especially when one considers that there is always discussion about how everyone wants “patina” on their leather products. In my opinion, you’re just getting a head start on the patina process. And, what’s the story behind those scars and marks? 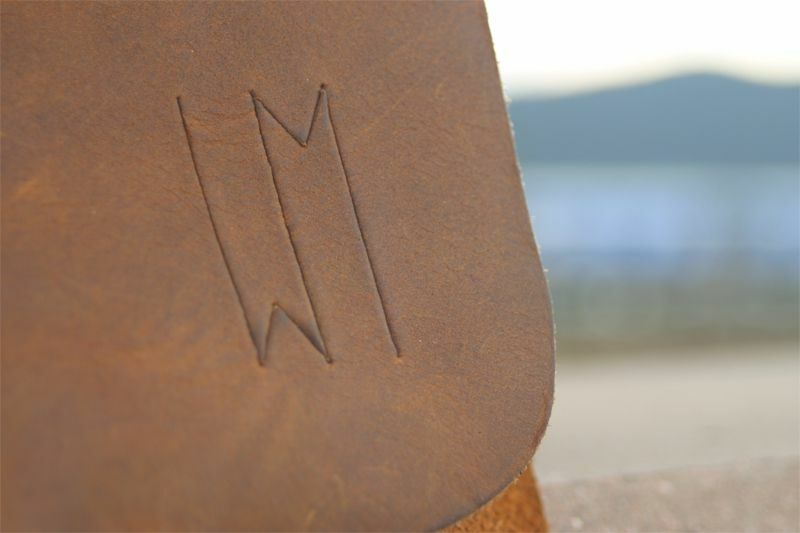 I’m curious…I like stories and, again in my opinion, those marks simply add to the back-story of a piece of leather that has been beautifully crafted into a bag that I hope to carry for years. Back to the construction − in discussing Waltzing Matilda with Mike, he also enjoys incorporating old, or “up-cycled,” components into his products. In the case of the Tom’s Bag, the stud closures are from WWI Swiss Army ammunition pouches. He also uses hand forged rings from a local blacksmith for the strap adjustment. The use of these elements just further enhances the back-story that comes with the Tom’s Bag. The Waltzing Matilda Tom’s Bag is great for every day carry. The main compartment is roomy – large enough to carry a tablet or even a 13” laptop computer and other miscellaneous items. I’ve also used it as a quick, on the go photography bag with much success. It can carry two full size dSLR cameras with lenses and a few other items making it ideal for quick photo shoots. The inside flap pocket is large enough to handle a phone or iPod and the smaller slot is idea for business cards, or my favorite – customer loyalty cards that I don’t want to carry in my wallet. The outside pocket under the flap is an added bonus where you can slip your headphones in the pocket, some change, etc. And you’ve got one more business card sized slot available. The strap is long enough that the bag may be worn cross body without issue. It’s also easily adjusted so that it may be worn on the shoulder conventionally too. There is not a handle on the bag and initially, I missed having one to grab. However, with use, I found that the bag functioned just fine and I forgot about the lack of a handle. It’s also important to note that there isn’t a way to secure the main flap of the bag. 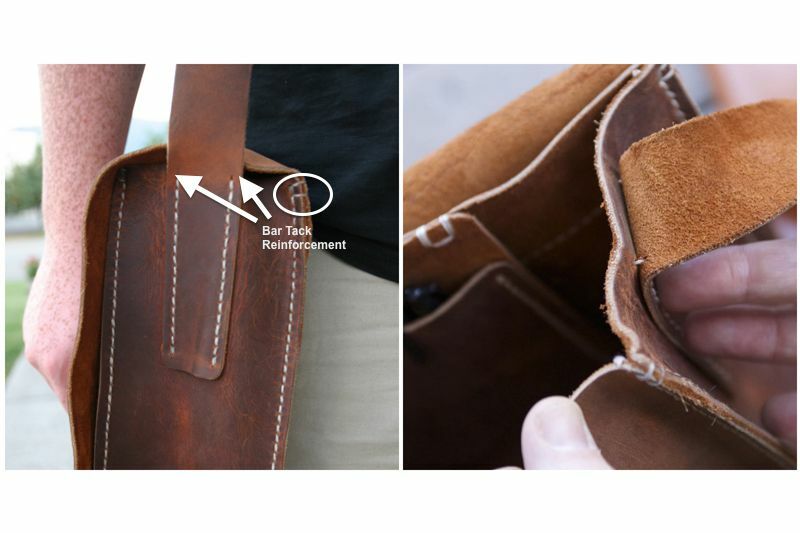 If you tend to turn your bag upside down, this may be an issue. I, however, have not found this to be an issue. Another little item to note is the stud closure on the small outside pocket. While I like it a lot, the back of that closure is exposed inside the pocket. It’s a little sharp and may potentially scratch a small electronic item or snag something inserted into that pocket. I wish there was a small piece of leather sewn around the backside of it to eliminate any issues. This is not an issue with the stud closure on the inside pocket. There is only one thing that worries me about the bag and that is the stitching where the strap joins to the bag. It is an area that I’m going to keep an eye on over time. It’s probably going to be just fine – however, I wish that there were a couple of bar-tack stitches across the very last set of top stitches just to serve as reinforcements to prevent separation of the strap from the bag. It looks great. The exposed stitching is pleasing to the eye. The soft floppy leather gets a lot of attention from people. They’re surprised at how soft it really is – and yes, they frequently ask to touch it. The stitching, the strap rings, and the stud closures are also items that get noticed and remarked upon frequently. 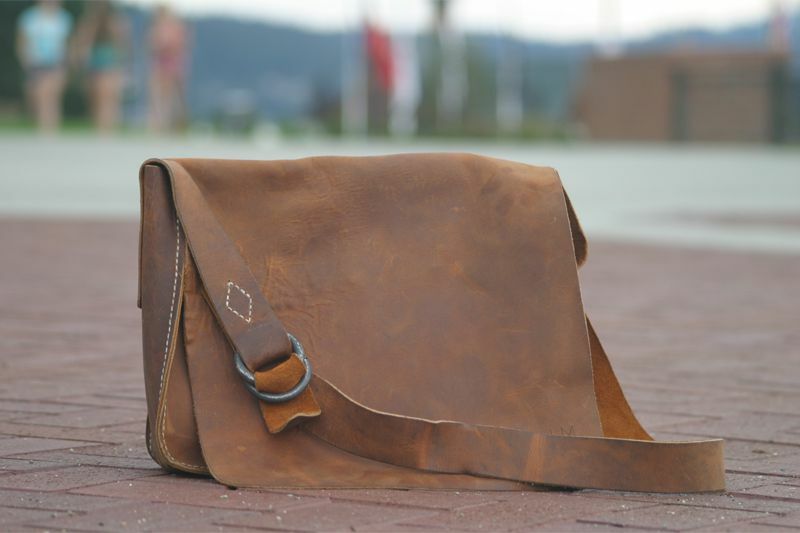 The Waltzing Matilda Tom’s Bag is a great piece of handcrafted, leather art. At $450, it’s definitely an investment for the long run. But, you can be sure that the bag will endure for many years to come while allowing you to stylishly brandish it with your wares safely tucked inside. I look forward to carrying this bag and adding to the story it already had when it was delivered to me. 5 Comments on "Waltzing Matilda Tom’s Bag – $450"